The Malaga Picasso Museum houses 133 pieces of work by the famous artist Pablo Picasso. Located in the heart of Malaga 45 minutes from Marbella. 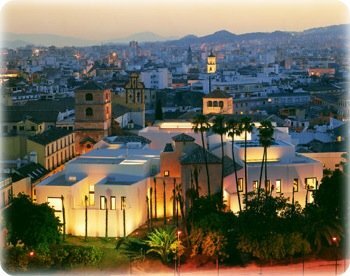 The Malaga Picasso museum offers a rich experience in museum culture that children may find fascinating. Picasso's wide use of style, materials and technique can captivate the interest of both young and old. Price: Permanent collection 6 euro, temporary exhibition 4.50 euro, combined ticket 8 euro; Children under 18 yrs: free; free admission from 6:00pm to 8:00pm only on Sundays and on October 27th (MPM birthday). Hours: Tuesday-Thursday 10am-8pm; Friday-Saturday 10am-9pm; Sundays and holidays 10am-8pm; closed Mondays, December 25th and January 1st. Son's evaluation: For me the Malaga Picasso Museum was boring because I am not really into art. There were a lot of weird paintings and few statues. The exhibition rooms are clean and the walls are white. Every room has a different ceiling which is interesting. Daughter's evaluation: I like art and seeing some of Picasso's greatest artwork was great. When we were almost finished I got a bit hungry and that distracted me a lot. I wanted to go to the cafe but my parents didn't want to. The cafe is big outdoors but small indoors, the food looks good but we did not eat anything. Luckily we finished looking at the whole museum in 1 hour so then we could go and eat. Mom's evaluation: Although I enjoyed the Malaga Picasso Museum very much, I don't think the kids found it as enjoyable as I did. The museum itself is quite small, so if you want to see nice art your kids don't have to suffer too much if they don't like going to museums. We did the whole museum at a leisurely pace in about an hour. And children under 18 get in free, so there's nothing to lose in case they don't enjoy it. The museum itself wasn't well indicated from the roads as you enter Malaga. We had a GPS that led us to the center of town so we managed to find the general whereabouts of the museum. However, when we parked and started to walk around you'll find signs indicating the direction of the museum, which is located just off a pedestrian walk. When we got to the entrance at about 12:00 we had a small wait as they check your bags for security. They don't allow cameras inside, so make sure you're comfortable with leaving it at the door, otherwise don't bring it. The Malaga Picasso Museum was built in 2003 so the building is very clean and modern showcasing each piece in a beautiful minimalist way. At the entrance the kids got little books to write their opinions about specific paintings. My 11 year old son didn't care much for the book, but my 9 year old daughter enjoyed answering the questions and writing about the paintings. We strolled around analyzing the paintings we liked and tried guessing what they were before reading the title. There are two levels to the museum that houses Picasso's lesser known oil paintings, lithographs, sculptures, photographs and models. I think it makes a nice simple introduction to children about Pablo Picasso's works and who he was. My daughter finds math a bit of a challenge, so we would play a game trying to guess how old Picasso was when he made a certain work. It's hard to keep the kids on their toes in summer when it comes to school work so I try to take little opportunities to practice math, reading and writing. There is a ground floor that shows the archaeological findings when they were building the site. This isn't as interesting, but will take you 2 minutes to walk through in case you are curious.